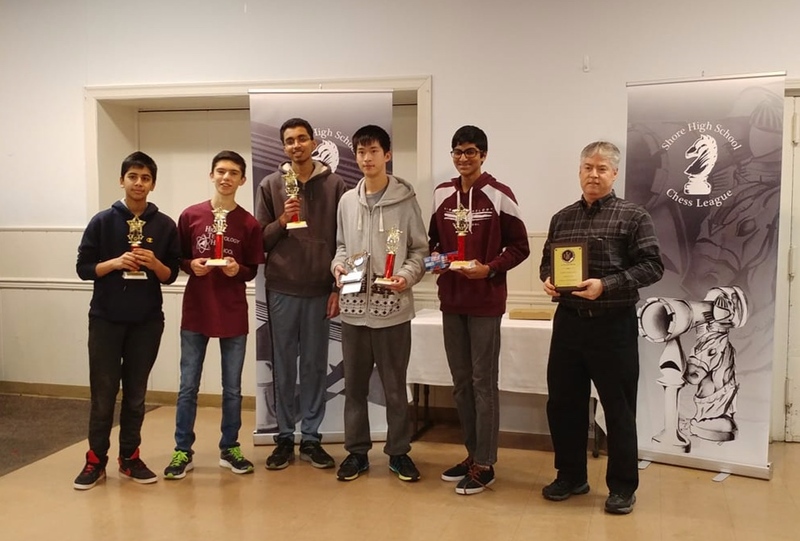 Congratulations to the varsity Chess Team for earning first place in the two recent tournaments sponsored by the Shore High School Chess League. Below are the details and a picture from each event. The team won the annual Toms River Elks Chess Tournament held on Sunday 1/20. They entered the 4 round competition as the 3rd seed and defeated both the 2nd seed and 1st seed teams in the final 2 rounds enroute to the title. The team was lead by tournament MVP Jason Yan. The other players on the varsity team were: Andrew Mascillaro, Abhinav Ramidi, Aditya Baireddy and Varun Tupuri. On Saturday, 2/2, they defeated St Joseph high school in the championship match of the annual Knights of Columbus Tournament to become the champions of the 2019 Knights of Columbus Tournament. This is the record breaking 5th consecutive year that High Tech has won the tournament!! The Varsity Team finished the day with a record of 4 and 0. They won an impressive 17 games out of 20. The varsity team consisted of Jason Yan, Andrew Mascillaro, Eric Chai, Abhinav Ramidi and Aditya Baireddy. Jason Yan was named the tournament MVP.